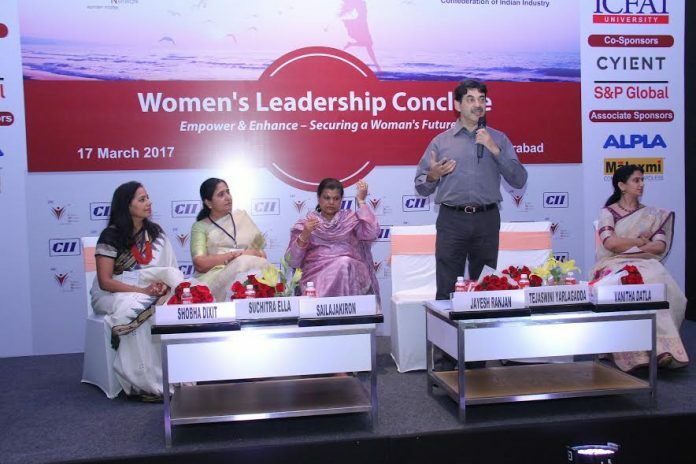 Hyderabad: CII – Indian Women Network (IWN) Hyderabad chapter, as a part of its Annual Day deliberations, organized a one day Women’s Conclave on the theme ‘Empower & Enhance – Securing a Women’s Future’, here today. The objective of the Conclave is to enable women professionals to gain a better understanding of physical, emotional, social and financial security. IWN believes that if women want to create a life that is filled with passion, achievement and reward, the most effective solution is through self-awareness, improvement and growth. In the inaugural keynote address, Mr. Jayesh Ranjan, IAS, Principal Secretary, Departments of Industries & Commerce and IT&C, Government of Telangana, opined that unity is an important aspect of women empowerment. “It’s a tremendous force when all the women are together and hence educate yourself & educate others and voice out”, he said. Ms. Sailaja Kiron, Managing Director, Margadarsi Group, in her Keynote title address on “Empower & Enhance: Securing a Women’s Future”, emphasised on the need to cultivate a network of trusted mentors and colleagues. “Walk on the beat of your own drum. Pick an occupation that you love as nothing gives you more happiness than going to work as if you are going to have fun”, she said. In her Special Address, Ms. Suchitra Ella, National Chairwomen, IWN & Joint Managing Director, Bharat Biotech International Ltd., mentioned that Indian Women Network is emerging as one of the important platform that supports career women and entrepreneurs. “IWN is not a social club but a powerful platform to support career women & entrepreneurs”, she said. Earlier, in her welcome address, Dr. Tejaswini Yarlagadda, Chairwoman, IWN Telangana, Director, Malaxmi Group, opined that if women want to create a life that is filled with passion, achievement and reward, the most effective solution is through self-awareness, improvement and growth. The conclave also has a special Workshop on Women’s self-defence led by Rudramadevi Self Defence Academy. Some of the other prominent speakers during the course of the day were: Mr. Bharani Kumar Aroll, Secretary, Society for Cyberabad Security Council, Telangana; Ms. Swathi Lakra, IPS, Additional Commissioner of Police (crimes and SIT) Telangana; Ms. Didem Atahan-Fabig, LMHC, MPH, Psychologist, besides others. They emphasised women to know about their rights, resources and be proactive about security. The conclave was attended by around 300 women professionals from various segments.